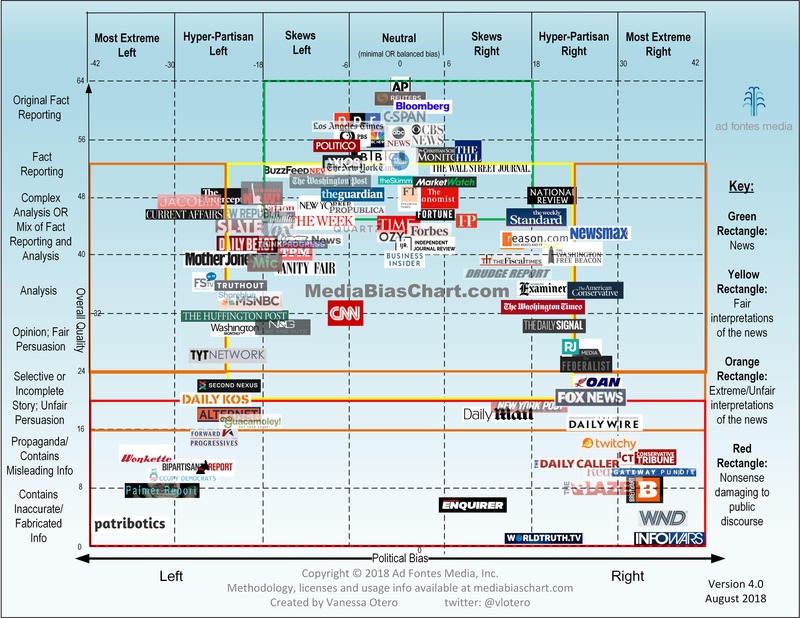 This week Beth and Kelly check in with Vanessa Otero, the creator of Media Bias Chart. The chart is now of version 4.0 and is working it's way to becoming an interactive web version along with an actual data company that will provide analysis of media sources over time. Kelly and Beth also discuss the recent murder of journalist Jamal Khashoggi and why the story is important, despite Breitbart's claims. Vanessa Otero, who is also a patent attorney, wanted to create this chart in the beginning to have have a reliable visual for herself and others to use as media sources grew increasingly biased. She recently changed the name of her website and company to Ad Fontes Media (Ad Fontes means "to the source" in Latin). Her newest challenge is creating the chart into a more interactive design, as well as establishing a team to use her already created rubric, so data analysis of media will be measurable and standardized. To this she has started an Indiegogo campaign, which you can find here: Media Bias Chart: The Next Level. And this doesn't even touch on the verbal onslaught he performs every time he attends another rally. The 'Lock her up!' chants, the Trump funded investigation of Obama's birth certificate, as well as years of harassment on Twitter, praising Republican Greg Gianforte for attacking a journalist and the list just goes on and on. After Beth and Kelly said goodbye to Ms. Otero, they delved into a horrible opinion piece full of fake news from (shocker!) Breitbart. Breitbart’s John Nolte proclaims that the media is pushing the Khashoggi story because they love to put journalists on a pedestal, over and above children going missing and women being murdered and raped. He even believes the story is only important because it follow what he believes is a great left-wing cause - to attack Trump and undermine his “successful (so far) Middle East policy”. However, the difference is this case goes a lot deeper than journalists being killed by cartels in Mexico (which is indeed a tragedy, and has been covered by multiple media outlets), no matter what Nolte believes. This action is an act of torture and mutilation possibly ordered by the Crown Prince of Saudi Arabia while inside the supposed safety of a consulate. Crown Prince Mohammed bin Salman and Saudi government officials has been caught in multiple lies throughout this media investigation, from assurances the day after Khashoggi’s disappearance that he had left after a a few minutes or an hour to claiming the 15-member hit squad were simply ‘tourists’ (who came and left within less than 24 hours and only appeared to have visited one place). The song contains multiple references to the children's book Where the Wild Things Are by Maurice Sendak. Newman sings, "Do you know where the wild things go?" In addition, the repeated refrain at the end of the song is a modified version of a portion of the book. Breezeblocks' lyrics are "Please don’t go, I'll eat you whole / I love you so". Sendak's words are "Oh, please don't go — we'll eat you up — we love you so!" Robert Neville is the last living man on Earth... but he is not alone. Every other man, woman and child on the planet has become a vampire, and they are hungry for Neville's blood. Credited as an influence by most major horror writers, Matheson's novel is psychologically terrifying, as it posits the age old question - who is the real monster? We examined more than 1,300 journalist killings between 2002 and 2013. Here’s what we learned.